Commercial plumbing is different from residential. If your business can be affected by plumbing problems, sorting them out should be your priority. The problem might be a small thing blocking your bathroom or a significant plumbing complication that causes the business to close down temporarily. When it comes to commercial plumbing, nobody ever wants to make mistakes. Most people think that hiring a licensed plumber with experience in business plumbing is easy, it’s not. Making a mistake may prove to be costly in the long run. To ensure that your plumbing needs are taken care of, take your time to shop around before making the final decision. 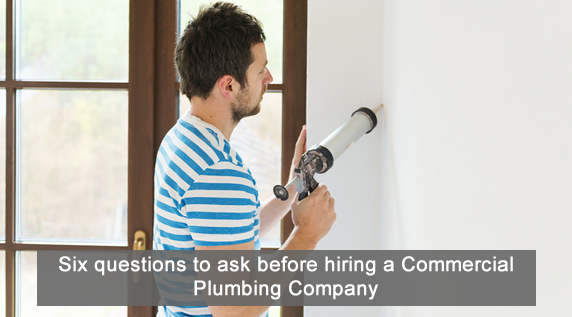 This article highlights six questions you need to ask yourself before hiring a commercial plumbing company. Is the plumber insured, licensed and experienced? A licensed plumber should know what is needed to make a job successful. In case of a mistake, liability insurance protects both parties. These two essential facts are critical when hiring a commercial plumbing contractor. You should also remember that a plumbing company should have plumbers who have experience in plumbing repairs and maintenance for all types of businesses. Very many companies rely on plumbers. You should ensure that the company you select will deliver perfect results. How long has the commercial plumbing company been in business? Commercial plumbers that have been in the industry for a long time have excellent reviews from many people. A company that is old most likely has experienced workers who have an outstanding track record of delivering high-quality results. Another advantage of getting a company that has been in the industry for many years is that they offer 24-hour emergency service. Do not let your business be at a standstill just because your plumber has not arrived. Does the company charge for estimates? Is the charge hourly or a flat rate? Before you sign any contracts, you need to know if your contractor is working for an hourly or flat rate. Plumbers who work on an hourly rate do not efficiently work since they want to spend more time so that they can overcharge you. When it comes to big plumbing jobs, your contractor should ask for small installments paid throughout the work period. On the other hand, for small projects, your plumber should request for payment once the job is successful. In some cases, some contractors ask for full payment up front. If you ever encounter such, run away as fast as you can. Have you ever done such a job before? Whether your plumbing job is simple or complex, you want to get a plumbing contractor who will be able to the job and do it well. If the plumber has the experience you need, ask for proof showing references to some of those situations. Doing this helps you know if the job will be well done. Therefore, if you are looking for plumbing experts and quality service for your business, your search has come to an end. Consider Accurate Leak and Lean, you will not be disappointed.